The Baltic Exchange (incorporated as The Baltic Exchange Limited) is a membership organisation for the maritime industry, and freight market information provider for the trading and settlement of physical and derivative contracts. 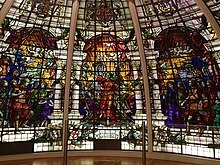 It was located at 24–28 St Mary Axe, London, until the building was destroyed by a bomb in 1992, and is now located at 38 St Mary Axe. It has further offices in Europe and across Asia. Its international community of 650 member companies encompasses the majority of world shipping interests and commits to a code of business conduct overseen by the Baltic. Baltic Exchange members are responsible for a large proportion of all dry cargo and tanker fixtures as well as the sale and purchase of merchant vessels. The Baltic Exchange traces its roots back to 1744 and the Virginia and Baltick Coffee House in Threadneedle Street. (English coffeehouses in the 17th and 18th centuries were important places for merchants and captains to exchange news.) It was incorporated as a private limited company with shares owned by its members on 17 January 1900. In November 2016 the Singapore Exchange (SGX) acquired the Baltic Exchange. It remains headquartered in London. The exchange provides daily freight market prices and maritime shipping cost indices which are used to guide freight traders as to the current level of various global shipping markets as well as being used to set freight contract rates and settle freight futures (known as Forward Freight Agreements or FFAs). Originally operating a trading floor, the exchange's members' transactions are today mainly conducted by telephone. In April 2018 the Baltic Exchange announced a global container index (FBX) in partnership with Freightos. An Liquified Natural Gas (LNG) assessment is planned for launch in 2018. The exchange was located at 24–28 St Mary Axe in the City of London until it was destroyed in a 1992 bomb, and is now located at 38 St Mary Axe, London. It has further offices in Europe and across Asia. ^ "Companies House entry". Retrieved 23 December 2015. ^ CNBC (26 September 2016). "Baltic Exchange names Mark Jackson as new CEO". CNBC. Retrieved 26 September 2016. ^ BalticBriefing (13 December 2017). "Baltic Exchange names Duncan Dunn as new Chairman". CNBC. Retrieved 13 December 2017. This page was last edited on 14 October 2018, at 11:23 (UTC).